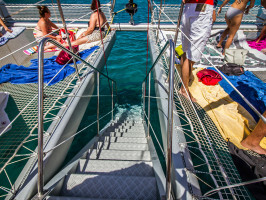 Discover the natural beauty of the island aboard a luxurious and spacious catamaran. Join us for a unique adventure that will leave you with some unforgettable memories. 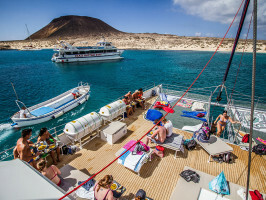 Jump onboard a spectacular sailing catamaran and set sail to the exclusive island of La Graciosa, the most serene of all the archipelago Canary Islands. 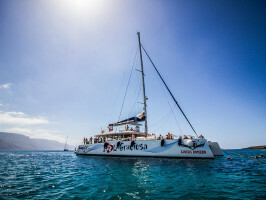 Shortly after setting sail from Orzola spring you'll see the north coast of Lanzarote from a whole new perspective whilst enjoying a refreshing mojito served as a welcome drink. 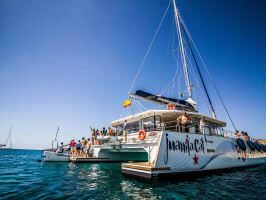 In addition to this, during the day you will have access to a free bar including beer, sangria and soft drinks, with a comfortable area to sunbathe and relax. And for lunch, our chef will prepare a delicious paella to be served on board. Once ashore, you will visit the beautiful town of Caleta de Sebo accompanied by your guide, who will point out all the main attractions. 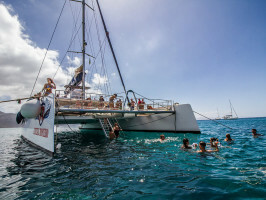 After we will board the catamaran again and sail to French Beach, where you can swim in the crystal clear waters and enjoy our fun water activities like snorkeling or kayaking. 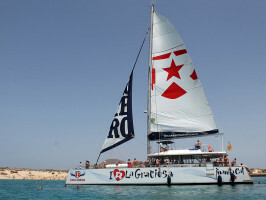 Playa Blanca at 8.30am, Puerto Calero at 08:30am, Puerto del Carmen at 8.55am, Arrecife at 09:35 and Costa Teguise 9.40am. All approx. Spanish, English, German, French, Italian, Dutch, Portuguese and Polish.